Predators are hunters that will kill and often eat other animals or prey. We think naturally of predators being mammals but birds may also be predators, such as Sparrowhawks and Magpies but also, perhaps more surprising, so can Great Spotted Woodpecker, Starling and many others. The predators that perhaps annoy us the most are cats and squirrels and the rest of this article focus on these. Cats have always been a problem in our garden - harassing and killing birds, killing fish and fouling the garden - but then in the 1990s, when nearly twenty different cats were intruding we decided something had to be done. Clear glass bottles filled with water and shiny metal foil on string to create reflections that disturb the cats. These had had no effect whatsoever. Cat pepper and ammonia, but these do not last very long in our wet climate. Sharp, thorny clippings, e.g. holly and blackthorn, on the ground to stop them walking and fouling the area. This does work but the garden can become unsightly with clippings all over the place. Electronic units that detect movement and either emit an ultrasonic noise or fire a water jet. One suggestion we did not try, for obvious reasons, was having our own cat to defend the garden from other cats. As well as deterring the cats, you can protect the birds by ensuring they have cover such as a tree or bush close to where they are feeding, but not so close as to provide a hiding place for cats and other predators. Although sceptical about the likely success of the electronic cat scaring devices we purchased several CATWatch units from Concept Research some years ago and placed them around the garden. These small devices (shown on the right) emit bursts of ultrasound when the integral movement sensor detects something moving. With the earlier Mk2 design, the exterior of the lens had a tendency to mist up with frost or dew and stop working until it cleared and the lenses also became brittle with age, but replacements were available from the supplier. Today, Concept Research claim that the latest Mk3 design reduces greatly these problems. Most cats are stopped in their tracks before making a rapid departure, while other more welcome wildlife such as foxes, bats and hedgehogs seem not to be affected. There are just two or three cats that visit the garden and seem not to be bothered by the cat scaring devices - it is possible they are older cats or of certain breeds that are hard of hearing. 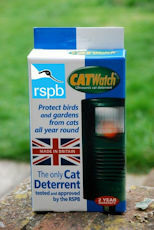 CATWatch is approved by the RSPB and is manufactured in the UK. Concept Research also manufacture a budget version called catfree, which is perfect for the smaller garden with the occasional visiting cat, as well as other electronic pest deterrents. There are other similar systems available; Primrose London stock a good selection. In the British Isles there are two species of squirrel, the Red Squirrel (Sciurus vulgaris) and the Grey Squirrel (Sciurus carolinensis). 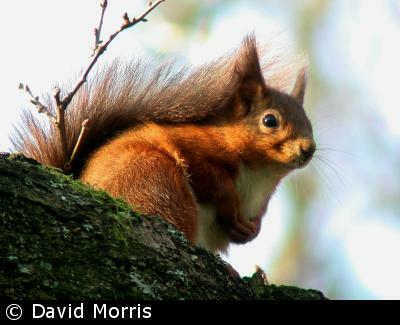 The Red Squirrel is the native species and now restricted to parts of northern England, including parts of Yorkshire, Lancashire and Northumberland, Scotland, Anglesey and the Isle of Wight, though there are programmes to try to expand their range. Their original range has contracted owing to a disease that is carried by the non-native Grey Squirrel. 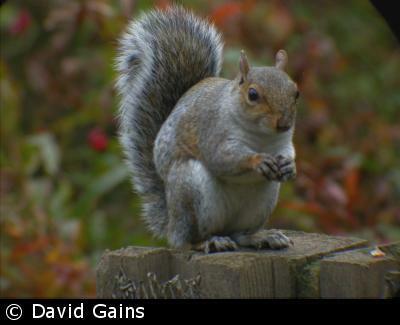 The Grey Squirrel was introduced from North America in the 19th century and is larger than our Red Squirrel. As mentioned already, they carry squirrel pox, which is usually fatal for Red Squirrels. They are extremely adaptable and have moved quickly into gardens, where they can often find plentiful foods that are intended for birds. Both species will feed on fungi, fruits and nuts but also birds' eggs and nestlings, particularly when other foods are scarce. When a Grey Squirrel first arrived in our garden it was a moment of great joy and entertainment, but they soon became a nuisance - eating everything in their sight, including a plastic bird feeder! They dig up the lawn to bury nuts and can quickly work their way through a bed of tulips, eating the bulbs as they go along. The seed feeders made from polycarbonate and galvanised steel have so far proven to be squirrel resistant to their gnawing, but these do not stop them eating the food. To stop them eating the food, you can fit baffles to bird table poles and cages around the feeders. An alternative to fitting the baffles is to grease the pole, but this is not always successful and also poses a risk to the birds' feathers. More sophisticated feeders are available that sense something heavier than a bird is hanging on the feeder and either collapse the perches or spin around, throwing the squirrel off. There are also chilli pepper based powders that you can add to the bird food. The squirrels, being mammals, find the chilli pepper too "hot" and leave the food, but birds do not mind it because their tongues are insensitive to the pepper. Nest boxes made from wood may have a metal plate fitted around the hole, which prevents the squirrels from gnawing at the hole to enlarge it in order to gain access to the eggs and nestlings that may be inside. Finally, you may prefer to provide the squirrels with their own feeders, filling them with peanuts, hazelnuts or acorns.